Communication is vital to our well-being. People living with dementia slowly lose their language skills and their ability to express themselves freely. This has a profound impact on their quality of life. There are many ways we can support people living with dementia to communicate more effectively. It is important to remember that how you say something is often more important than what you say. Patience and empathy are key. Here are some tips to help communicate with people living with dementia. Your client or loved one will get worse with time. Communication will become more difficult. On the other hand, remember there will be good days and bad days. Be prepared. 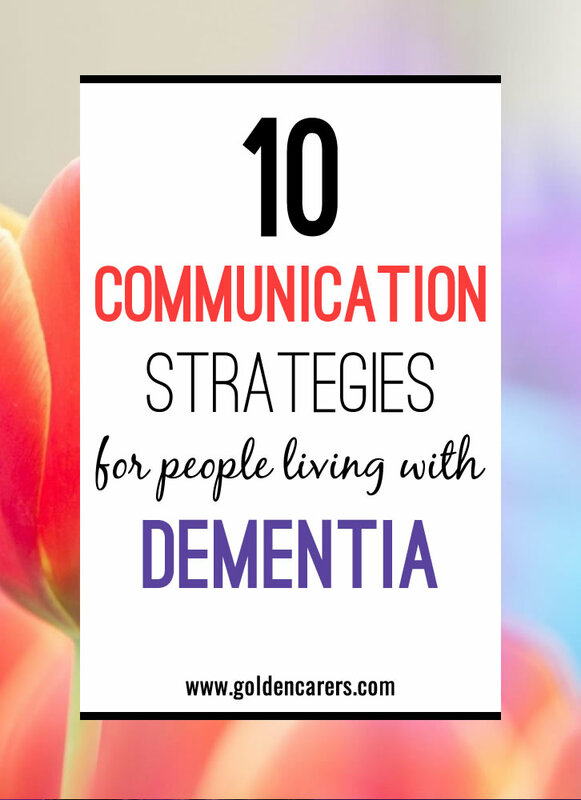 Communicating effectively is one of the greatest challenges seniors living with dementia face. Tolerate compassionately any delays, adversity or provocation. Listen attentively and empathize with their concerns even if they are delusional, confused, hesitating, or angry. Offer reassurance and support. Noise can disturb and confuse people living with dementia. Find a quiet place to talk, away from the tv, radio, or people passing by. When talking, place yourself in front of your client and speak in a clear and warm tone. Use simple sentences and give clients ample time to respond. Do not contradict what they are saying and don't speak to them as you would to a young child. Gestures, touch and facial expressions can assist communication. Observe if client's non-verbal cues indicate other messages, in spite of the words they are saying. Perhaps there are other feelings behind the words they are saying. Avoid pronouns such as 'they' 'he' or 'she'. Refer to people by their preferred names. Focus on one subject at time; people living with dementia cannot handle two or three threads of conversation. If asking questions make sure they can be answered with a simple 'yes' or 'no'. When talking about your client in their presence, assume they can understand everything you say. Don't talk about them as if they were not there. If you feel frustrated, take a break. You are not perfect! A person living with dementia is very capable of reading your body language. If you do not mean what you say they will know. Taking a break will benefit both parties. What strategies have you found to work well to enhance communication with people living with dementia? I find that I have to redirect his focus on me when speaking with him. Otherwise he continues the behavior, like kicking his legs in the air or pinching his clothes. I spend a lot of my visiting time reassuring him that we love him, that we care for him. Not to make him feel as though he is taking a "Step back", but what about a communication flip book, they can be tailored to the things that he generally would like to express, are a symbol alphabet (which may become more beneficial as his disease process continues) , and can be used in conjunction with verbal discussion to help get over the humps. He can help in the process of making the book and choosing the things he wants to be able to communicate. looking forward to communicating with you all . I have a very lovely man in our dementia care unit. He is very friendly most of the time and with prompting he will participate in some activities. The problem is he can speak English but is now only speaking Italian and I can understand him. I prompt him to speak English and I know he is trying but he just gets stuck. We have another person who speaks English and Italian but he can figure out what he's trying to communicate either. Apparently their are different dialects and they can be very difficult. How can I communicate or understand what he is trying to say. It's so fustrating for him. I try simple sentences or gestures but it only makes him more frustrated. I try to redirect but that frustrates him and I don't have it in my heart to just walk away so I continue to listen and he eventually gives up. I don't want him to just shut down and not talk because we can't understand him. Anyone have and suggestion other than me learning Italian, or hiring a translator? Hi Donna, how lovely of you to consider learning Italian to speak with your client. This is what make our profession so special. Sadly, I donât have any knowledge of courses in dialects, Italian or otherwise. Congratulations on your compassion. You are quite right, if nothing is done your client will stop speaking altogether, which would be a crying shame. Many facilities have translators but for especial or emergency occasion only. I would try instead try to find volunteers fluent in his dialect. You could try the Community Board of Churches and Supermarkets; place a request for volunteers in your clientâs dialect. Best wishes. Great tips, thank you. I also find being up close and looking and speaking directly whilst looking the person in the eyes can also help. Really show you are concentrating on them and speaking solely to them. This is worth sharing to other RAOs ( Recreational Activities Officers). I will definitely share this in our up coming network meeting this month. Thank you Almira. I hope they find it helpful. Thank you for the clear statement of these ideas which speak with empathy directly to me as carer. They also give an enduring voice to my Loved One, in ways of which she will not always be capable. Importantly, the tip "1. Realise Your Challenge" leads the list rather than appearing awkwardly later. Thank you for your feedback Daryl, this is much appreciated.